A Gifted Youth. 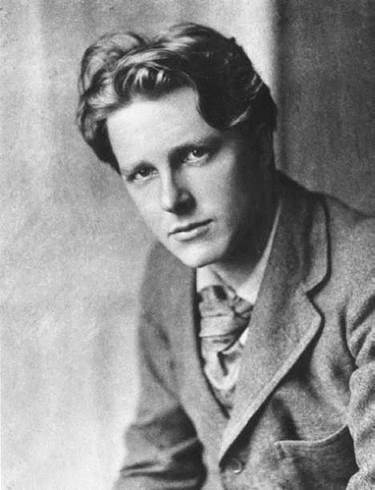 Rupert Brooke was born on August 3, 1887, in Rugby, England, one of three brothers who would all die young. Good-looking from infancy, he was a fine athlete, good at soccer, cricket, tennis, and swimming, as well as intellectual pursuits. Brooke began writing poetry at the age of nine. By his teens he was writing in earnest. Brooke’s student years at King’s College, Cambridge, were full of creative experimentation with politics, sexuality, and poetry. He became the president of the Fabian Society, a student group promoting socialist politics. Brooke was bisexual, and he was surrounded by both male and female friends who were in love with him. One of these was James Strachey, the younger brother of Lytton Strachey, who was close friends with writer Virginia Woolf and others in the intensely intellectual and sexually liberated set known as the “Bloomsbury Group.’’ Brooke eventually tired of the Bloomsbury crowd and set off on an ambitious series of world travels. He went to Italy twice in his late teens, to Germany in his twenties, and he traveled across the United States and Canada in 1912 writing pieces for the liberal London newspaper the Westminster Gazette. From San Francisco he set sail for the South Sea islands—Hawaii, Samoa, Fiji, and Tahiti. Death in World War I. Brooke joined the Royal Navy Volunteer Reserve in August 1914, the first year of World War I. Beginning with the assassination of Austro-Hungarian archduke Franz Ferdinand in 1914, the countries of Europe aligned with Germany on one side and the Allied Powers—France, Russia, and the United Kingdom—on the other in an attempt to establish control over the region. World War I was the first conflict that saw widespread use of armored tanks and chemical warfare, which left many survivors permanently disabled or disfigured. Although Brooke himself never engaged in combat, nearly ten million soldiers were killed during the war, with another ten million civilians suffering the same fate. Rudyard Kipling (1865-1936): A British author born in Bombay who wrote in almost every genre—poetry, journalism, fiction, essays, and children's stories. Lytton Strachey (1880-1932): A London-born biographer and essayist who was a prominent member of the Bloomsbury Group, which advocated intellectual ambition and sexual tolerance. He wrote for many periodicals and contributed several innovative biographical studies, including the influential anthology Eminent Victorians (1918). William Butler Yeats (1865-1939): This Irish poet and playwright set the agenda for modernist poetry throughout his long career. Like the painter Picasso, Yeats went through several experimental styles, each deeply marked by his strength of personality, political convictions, and formidable artistic technique. Sigmund Freud (1856-1939): An Austrian psychiatrist whose influence reached far beyond the practice of medicine. His theories of the powerful conflicting forces that exist in the subconscious mind affected all of the arts, helping to establish modernism as the exploration of the fragmentation of the individual mind that can hardly begin to fully understand itself. Archduke Franz Ferdinand (1863-1914): Heir to the Austro-Hungarian Empire. Austria had taken control of the provinces of Bosnia and Herzegovina in 1908, a deeply unpopular move among the Serbians, who wanted these territories to be part of a Serbian state, not the Austro-Hungarian Empire. A Serbian terrorist assassinated Ferdinand on June 28, 1914, setting into motion a chain of events that would quickly escalate into World War I.
Brooke’s early models were the so-called “decadent’’ writers: Charles Baudelaire, Algernon Swinburne, Oscar Wilde, Walter Pater, and others. The ‘‘decadents’’ often wrote about morbid or perverse topics with an excess of self-expression and moodiness, emphasizing the importance of pure art for art’s sake. While their works may seem dated or exaggerated now, they were nevertheless important for making the transition away from the moralistic realism that dominated the nineteenth century and into the artistic experimentation and new subjective perspectives of twentieth-century modernism. Poetic Experimentation. The poems Brooke wrote between 1905 and 1908 reflect this transitional period. Poems such as ‘‘Sleeping Out: Full Moon,’’ ‘‘Ante Aram,’’ and ‘‘The Call’’ are filled with abstractions, heavy imagery, antique spellings of words, and imperfect rhythms—they are written to sound like what young Brooke thought poems should be, rather than poems written in his own unique voice. Similarly, Brooke’s college-era love poetry is often beautiful but abstract and impersonal, heavily influenced by the idealism of the Romantic poets Percy Shelley and John Keats. William Butler Yeats, the dominant poet of the day, met Brooke and advised him to leave behind the empty abstractions and replace them with a more robust sensuality that would come to be more typical of modernist literature (as evidenced in the poetry of Yeats and the novels of James Joyce and D. H. Lawrence). Brooke was slow to take the hint, however, and instead became one of the leaders in a small John Donne revival in 1912. Donne (1572-1631), a great poet of both sensual and spiritual matters writing around the time of William Shakespeare, was a ‘‘metaphysical’’ poet who fused the abstract and concrete, soul and body. Brooke attempted to do the same, but again he had not yet found his own poetic voice. Nationalism. It is perhaps not surprising that Brooke wrote his most famous poems about his nostalgic love for England and praise of its countryside only when he was far away from home. Brooke’s travels to the South Sea islands seemed to set him free from the expectations other people had of him and the assumptions they made based upon his appearance. Brooke soon became associated with the ‘‘Georgians,’’ a group of poets writing around the time King George V came to the throne in 1910, who wrote sentimental poetry about rustic life and nature in the manner of William Wordsworth (17701850). War. Brooke’s best-remembered poems are the sonnets he wrote about war. These were collected in 1914, and Other Poems, published in 1915, after his death. Brooke’s war sonnets perfectly captured the mood of the moment. Unlike such later war poets as Wilfred Owen (1893-1918) and Siegfried Sassoon (18861967), who would live long enough to see more of the horrors of war, Brooke wrote of the service to country and noble causes with a spirit of brave optimism. His war poetry may seem hopelessly idealistic to more cynical readers today, but at the time it provided genuine consolation and encouragement to weary soldiers homesick for a safe, supportive, and unchanging England. ''Ode on a Distant Prospect of Eton College'' (1742), a poem by Thomas Gray. In this poem the poet looks over the rolling hills at the site of his former school, pondering his past life and approaching demise. Lyrical Ballads (1798), a collection of poems by William Wordsworth and Samuel Taylor Coleridge. The straightforward poems in this collection turned the page to an entirely new era of Romanticism in English poetry. Moortown (1979), a collection of poems by Ted Hughes. These poems portray life in the English countryside in a realistic but still idealized way, showing how the virtues of hard work on the farm and simple human decency can put mankind in harmony with the rhythms of nature. Only one collection of Brooke’s poetry was published in his lifetime: Poems (1911), which contains fifty poems. After his death, 1914, and Other Poems was published; it includes thirty-two more poems written between 1911 and 1914, including the immensely popular war sonnets. The War Sonnets. When Brooke died, he was hailed as a hero, even though he had seen little or no actual combat. Winston Churchill himself gave him a very eloquent eulogy. As Edward A. McCourt later wrote in his survey for the Dalhousie Review, ‘‘The popularity of the 1914 sequence is accounted for by the fact that through it Brooke expressed perfectly the mood of the moment. ‘‘As the war dragged on and death tolls climbed higher and higher, however, what used to seem idealistic in Brooke’s poetry started to look more like foolishness to many people. The more cynical and intense poetry of Wilfred Owen, Robert Graves, and Siegfried Sassoon captured the violence and ultimate futility of the war, and their poetry became elevated over Brooke’s as greater literary achievements toward the end of World War I and throughout World War II. Myth and Reality. From the 1970s until today, critical attention on Brooke is often focused on efforts to separate the Rupert Brooke ‘‘myth’’ from reality. Recently, Brooke’s poetry has been given energetic re-readings in light of new biographical perspectives. While Brooke has had a rough time with professional literary critics from the 1940s onward, his reputation has always been, and continues to be, secure with general readers. His poetry often shares a shelf with poets such as Robert Frost and Carl Sandburg—sensitive, easy-to-understand poets of nature and human conflict who appeal to people who read their poetry for pleasure and insight. 1. To what extent should a poet’s work be separated from his or her life? Should the ‘‘legend’’ of a poet’s life be relevant to what they wrote? 2. Why do you think some of Brooke’s best writing about England happened when he was in a place that could hardly be more different—the South Sea islands of Hawaii and Tahiti? What did Brooke find so appealing about these places? 3. Read some of Brooke’s early poetry. What are your own opinions about its quality? Have the critics been unfair, do you think, to the poetry Brooke wrote when he was just a teenager? Write your own assessment of one of his poems. 4. Using your library and the Internet, research the poetry that is being written by soldiers fighting in Afghanistan and Iraq today. Can you make any generalizations about the style and perspective they are using? How does it compare with the poetry written by soldiers from World War I and World War II? What has changed, and what has remained the same, about war poetry? Brooke, Rupert. The Collected Poems of Rupert Brooke. Edited with a memoir by Edward Marsh. London: Sidgwick & Jackson, 1918. Hassall, Christopher. Rupert Brooke: A Biography. London: Faber & Faber, 1964. Jones, Nigel. Rupert Brooke: Life, Death, and Myth. London: BBC Books, 2003. Lehmann, John. The Strange Destiny of Rupert Brooke. New York: Holt, Rinehart & Winston, 1980. Rogers, Timothy. Rupert Brooke: A Reappraisal and Selection from His Writings. New York: Barnes & Noble, 1971. Twentieth-Century Literary Criticism. Vol. 2. Ed. Dedria Bryfonski. S.v. Rupert (Chawner) Brooke (1887-1915). Detroit: Gale Research, 1979. Broyard, Anatole. ‘‘The Poet as Hero.’’ Review of The Strange Destiny of Rupert Brooke by John Lehmann. New York Times Book Review (January 24, 1981). The Rupert Brooke Society Homepage. Retrieved March 3, 2008, from http://www.rupertbrooke.com. Rupert Brooke, 1887-1915. Retrieved March 3, 2008, from http://www.english.emory.edu/LostPoets/Brooke.html. World War One Poets on the Battlefield: Rupert Brooke and Friends. Retrieved March 3, 2008, from http://www.1914-18.co.uk/brooke.